Synthpop was everywhere by 1986. Even artists that came from more of a rock background embraced the sound of keyboards, including a female singer who made a return to the top 50 this week that year. Elsewhere on the ARIA singles chart from this week in 1986, two of my favourite synthpop hits of the year debuted, while a synth-based Euro dance track also made its presence felt. Good times. For the second week, Starship stayed at number 1 despite strong competition from the single zooming into second place. How long could "We Built This City" hold off "A Good Heart" by Feargal Sharkey? For some reason, this easy listening tune sounds more like the Family Ties theme than the Buddy Holly rock'n'roll classic it's actually a cover version of. This happy clappy little number is taken from the concept album linked to the stage musical Time - a sci-fi production about a rock star (played by Cliff) who's transported to the High Court of the Universe. Or something. This non-UK single was taken from the reformed British band's Cosi Fan Tutti Frutti album, the last LP attributed to UK Squeeze (and not just Squeeze) in Australia. Apparently the movie's not great and this repetitive theme tune isn't either. But, the combination of Paul McCartney, who'd been having a pretty good run of hits (five top 10s so far in the '80s), and actors Dan Aykroyd and Chevy Chase, who'd both had a string of box office successes in recent years, was enough to see "Spies Like Us" hit the US top 10 and UK top 15. Australia was less impressed. Another act coming off a good chart run is Philly rock band The Hooters, whose first two Australian singles had both hit the top 10. Things came to a grinding halt with "Day By Day", which actually outperformed "All You Zombies" and "And We Danced" in America. Fairly similar in style to the latter of those two singles, "Day By Day" probably deserved better locally - and it's a little bit of a surprise that the radio-friendly track didn't receive a warmer reception. Ballad "Goodbye Girl" had brought Go West's top 50 run to a grinding halt, and so it was back to the upbeat pop numbers - and back into the chart with "Don't Look Down", which was remixed from the original album version and given the added subtitle "The Sequel" for its single release. The chart return was short-lived, with nothing from Go West's 1986 remix album, Bangs And Crashes, nor their second studio album, Dancing On The Couch, reaching the ARIA top 50. We wouldn't see them there again until a certain soundtrack hit from 1990. Treading a fine line between pop brilliance and novelty naffness, this debut single by Italian Eurodisco outfit Baltimora was a hit across the Continent in mid-1985. With a chorus melody based on Tarzan's jungle cry, "Tarzan Boy" was always going to be a difficult song to follow up - and Baltimora never landed another hit in most countries, but tracks like "Woody Boogie" and "Juke Box Boy" did provide further success in Italy. Despite an image that was pure Eurotrash, Baltimora's energetic frontman was actually Irish-born Jimmy McShane, who unfortunately didn't benefit from "Tarzan Boy" being used in a worldwide Listerine commercial in the early '90s since he didn't have a hand in writing the song - or, if you believe some reports, even singing the lead vocal. Instrumentals were really big in the mid-'80s, weren't they? Following the debut last week by "Miami Vice Theme", this stirring soundtrack single from Brat Pack classic St Elmo's Fire finally made the top 50 after a nine-week climb. The first official single released by power ballad composer and producer David Foster, "Love Theme..." proved to have real staying power, remaining in the top 100 until late July. 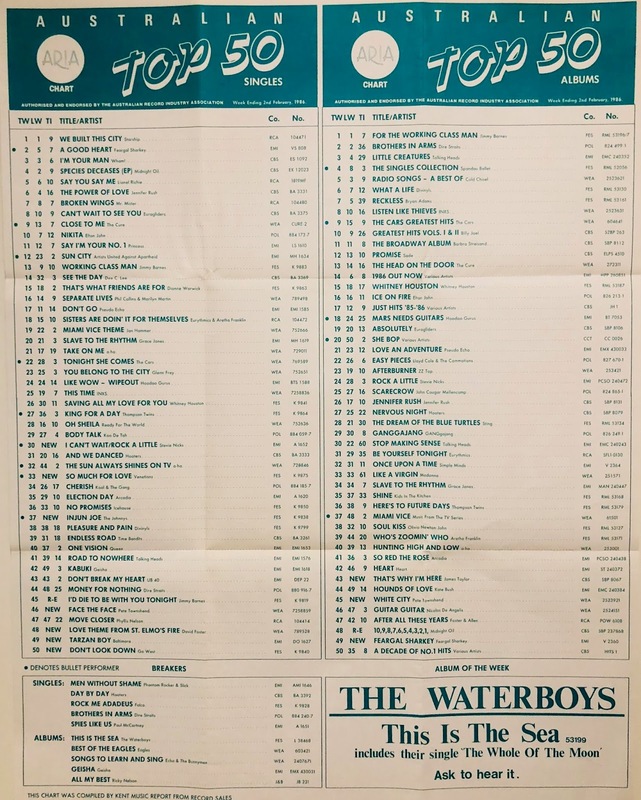 For someone who'd been releasing music away from his band, The Who, for as long as he had - albeit often in the form of limited release concept albums - it's a little surprising that it took Pete Townshend until 1986 to land his first ARIA top 50 hit. The first single from another concept album, White City: A Novel, "Face The Face" was a peppy tune with a high-speed swing sound that disguised the fact that the song and LP dealt with quite serious subjects. Watch out for Pete's daughter Emma in the music video providing some featured backing vocals. Putting the Western into country and western, Sydney band The Johnnys had made a name for themselves on the pub rock circuit before signing to Mushroom Records and releasing this Ross Wilson-produced breakthrough single. Possibly too politically incorrect to be released these days - "Native American Joe" doesn't have the same ring to it - it also came with helpful guitar tabs in the music video so you could play along at home. An Aussie band at the other end of the musical spectrum now - although one that'd also released a song with questionable racial stereotyping in the form of "Chinese I's" back in 1983. There was nothing potentially controversial about "So Much For Love", an awesome example of Australian synthpop that became the Sydney band's first and biggest top 50 hit. Thanks to the production skills of Mark Opitz, "So Much For Love" had a big, stadium sound that was reminiscent of INXS's more synth-based singles - and so it wasn't a complete surprise when the track picked up some attention in the US, denting the Billboard Hot 100 and receiving a glossy new video (below) to replace the original Australian clip. 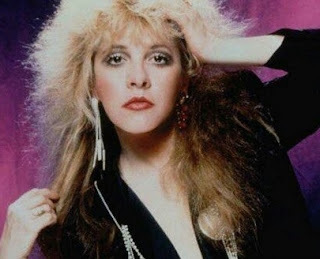 Despite the questionable judgement she showed in other areas of her life in the '80s, Stevie Nicks had excellent form when it came to kicking off her solo albums with killer singles. In 1981, the collaboration with Tom Petty & The Heartbreakers, "Stop Dragging My Heart Around" (a number 10 hit in Australia), had launched debut album Bella Donna. Then, in 1983, The Wild Heart was led by "Stand Back", which peaked at number 20 and was her last chart appearance until this first single from Rock A Little. A furious blast of synthesizer-drowned pop/rock, "I Can't Wait" was about as far removed from Fleetwood Mac as you could get. Balance was restored by the album's title track found on the double A-side, but for me it was all about "I Can't Wait", with its erratic vocal and even more frenzied music video performance. By contrast, the US opted for the more staid "Talk To Me" as the lead single, which we'd get next. Next week: another big European hit finds its way to Australia, plus a new hit from another local synthpop band and a national treasure makes a comeback after a spectacular fall from grace. Go West definitely don't sound like the kind of act to have a remix album. I didn't see the 'Tarzan Boy' video until the early 00's, so was most surprised when I saw the "singer" looked nothing like I had pictured. An Irish man it sounds like not; it surely has to be an Italian providing the vocals. Fab song though. Didn't think I knew 'Love Theme', but it sounds familiar. Didn't know 'Injun Joe' but it's not bad for what it is. 'I Can't Wait's probably my favourite Stevie track. I love this quote from her about the video: ""I look at that video, I look at my eyes, and I say to myself, 'Could you have laid off the pot, the coke, and the tequila for three days, so you could have looked a little better? It just makes me want to go back into that video and stab myself." Yeah, I laughed when I read that on Wiki too. I interviewed Stevie a few years back and she was open about everything. She even told the operator that we weren't finished when the end of the allotted interview time came - which apparently she does a lot of the time. 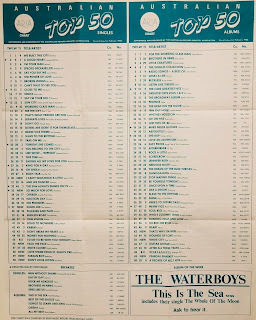 Having not owning any of the Kent Music Reports, and only owning the odd scan from certain weekly charts, I've always wanted to know what the '*' and the '+' represent to the left of the song titles. Obviously one refers to it being a song from an Australian artist, but the Divinyls 'Pleasure and Pain' doesn't have a '+'. Why the two symbols? Yes, that's a very good question. I've looked all the way down to the end of the top 100 and the code for what the symbols indicate isn't on there, so perhaps it was on a cover sheet for the full report? Any chance you've got the album chart from this week as well??? I'm hoping to have the proper ARIA chart soon, so albums will be on that and I'll replace it on here. But that might be another few weeks away. Next week's post will also be a Kent Music Report, then it's back to the proper ARIA charts after that.